Exams are done, homework is completed and it is time to celebrate with friends and family. For you and your family, hosting a graduation party can be a memorable occasion that is the beginning of a new stage of life for your high school or college graduate. How can you make this day special? Here are some ideas from caterers in Cleveland that can make your party fun. Choose a great cake as the focal point of your party. Get your cake in school colors or in the shape of the school mascot. For high school graduates, choose either high school or college colors, depending on whether your child would like to celebrate their accomplishments or focus on their future. Plan for people to come in and out. With many kids graduating all at the same time, plan on people stopping in to offer their warm wishes for a short amount of time. Plan snack or buffet style food that can be held over several hours and is ready when guests arrive. Enjoy your day, too. Instead of trying to do all of the cooking and serving, consider hiring kids to help serve the food, or have a caterer provide all of the food for you. That way, you can enjoy your day and spend time with your guests without having to worry about serving or food preperation. Choose your child’s favorite food. Instead of trying to make your meal formal, think about serving all of your child’s favorite food. Mexican food, pasta, macaroni and cheese, hot dogs and chocolate are all foods that can be easily added into a menu for a graduation party. Incorporate your child’s interests. Whether your child loves theater, marching band or lacrosse, add personal touches to your party decorations. A helmet, part of a costume or a musical instrument on a display table let people know more about who your child is and what their interests are. 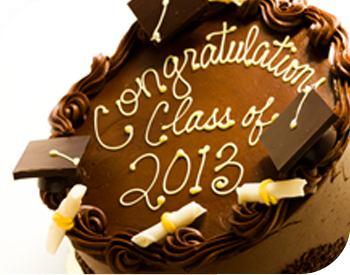 Planning a memorable graduation party can be more than just hamburgers on the grill. By adding in personal touches, food your child loves and displays items that celebrate their uniqueness, you can make a statement that your friends and family will remember. The best tip of all? Let us do the cooking! We can create a family-friendly menu and do all the work so that you can enjoy your child’s special day. Call us today!